Superb hat! Have had many complements on it. Warm, even on windy below zero days. The only thing I would advise is that prime coyote fur is quite long, 3"-4", and this can be a bit of a challenge as it drops down in front of your eyes making is difficult to see. Some CAREFUL shearing of the front right above the eyes set things right for me. If you're not experienced with a clippers I would suggest you ask your barber or stylist to shear if for you (perhaps furhatworld could do it before shipping?). With proper care this hat should last many years. Last year I bought a cheap rabbit fur urshanka from one of those pavement stands near the Brandenburg Gate. Trouble was after only one year the thing moulted so seriously it was impossible to wear. Then I found FurHatWorld. Quick, friendly and patient customer service answering my doubts about German customs duties and formalities - and rapid shipping too. Excellent. I havent worn it yet cos like other reviewers say fur needs snow on the ground and the Berlin winter hasnt struck yet. Its a pity FHW dont do fur jackets for men too - but perhaps just as well for my bank balance! I purchased the hat because I have always wanted one to keep my bald head from freezing while outdoors in crappy Maryland weather. I does the job and I occasionally get a compliment or two. The product is well made and fits perfectly. The ordering processing is flawless and happily I recieved it just before two storms hit in February. I use a form to open store it so that it keeps from matting. I have learned from experience that one doesn't store leather or fur products in covers that do not breathe. It is difficult to find the right headgear that keeps my head warm while also protecting the back of my neck and face during cold windy weather. I find hoods too restricting and like the freedom of a hat. The coyote full fur Russian hat keeps me toasty. The fit chart sizing is accurate, the coyote fur is beautiful, the workmanship is flawless. The website was easy to use and the service was seamless. Overall, I am very satisfied with the company and the product. Purchased for Father for Chritmas as the old one I puchased in Russia years ago has seen its day. Hat looks awesome and well made. Just hoping it fits. A bit tight on me but think it will be good for him. He is 91 and loves to get out and use the snowblower in winter. Will be a great hat for him. Great price. I purchased my Wolf in Alaska and paid much much more. I am very happy with the quality and fit of the hat. I ordered an XL and measure 60cm or wear a 7 1/2 to 7 5/8 ball cap and it fits perfect. The hat ships compact in a smaller than expected box, but after opening and relaxing the hat achieves its full expected volume. The hat is warm, the hat is made well, and it will be well received by others. On days when worn, be prepared for comments and compliments. This is my seventh hat and definitely my favourite. Extremely warm in severe weather. -37C feels like a day at the beach. Had many favourable comments from strangers. Soft, warm, comfortable. Perhaps one day a jacket to match. Ordered just prior to Christmas and thought I might receive it afterward. Sure enough, FurHatWorld came through in customary style and it arrived 3 days before Christmas. Thanks, FurHatWorld! Very nice hat. Also very warm. I am very satisfied with the overall look. Many people have told me they like the look of the hat. I should have ordered one size bigger than the measurements suggested... it is a little tight when the flaps are up and tied. Looks well made. Looks awesome. Purchased for Christmas gift for Father, so just hoping it fits.Bought one in Russia years ago for him and time for a new one. A bit tight on me but think it will be a huge hit. Great price also. I purchased one in Alaska and Paid much more.. This is my second hat from fur hat world and I am very happy with both of them. You will not find a warmer hat anywhere! The service and delivery is a cut above the rest, three days and it was in our house. Thanks for the great service again fur hat world! fantastic! saw this hat in Juneau Alaska where they wanted $1K more than fur world and dropped down to $200 more then we left the shop owner gaping over the web site as I found this one online! the quality is exactly the same or better! and we found it on sale! it is extremely warm! Really love my Hat. If i had one small critisism, another couple of centimeters deeper to sit more firmly on the head also due to the nature of the fur need to trim over the eyes as a little annoying. Very good service as I had to return another model and all went smoothly. Love it. This hat is really cool and of an excellent quality. It's very comfortable to wear and all around unique. Canadian hat size is tight - take it one larger (original 60-61 --_ 62-63) and you'll be comfortable. The shipment to Switzerland was reliable and tooks only 5 days. Had this hat for about a week now. It looks really good, pretty much exactly like the picture. Seems like good quality but time will tell. Ordering was straight forward and easy. Shipping really fast even though I ordered during the holidays. Strongly recommend this site and I will be ordering again soon. Received my Coyote Fur hat in record time... very impressed with the speed it got here.. loving the cold weather here in the UK at the moment : O ) a superb beautiful !!! quality hat.. soooo warm i totally love it.. had lots of positive comments !! if only you had a coyote men's fur coat for sale ! Excellent fur and workmanship, warm even for people with little or no hair. Excellent service which allows customers to try a variety of shapes and sizes. I use it mainly for work in the bush or cross-country skiing when it gets really cold, but it is also a fashionable item. I always wanted a coyote fur hat but could never find one that looked quite right and was real full coyote fur and well made. After receiving my hat I was very pleased with the quality, look and fit. The web site was easy to use and I would recommend this company to anyone. Being outside in the Michigan winters makes this warm furry hat a must...so why not enjoy the best and yes, it gets comments and you make a statement with this warm beauty! I purchased this hat late spring 2012. Was never cold enough to wear it until winter 2012. Love it! Good fit, fun to wear, and get many compliments on it. Service was above and beyond expectations. Awesome hat! It's exactly what I expected, comfortable to wear and warm. As in previous comments, order the next size bigger than your hat size. 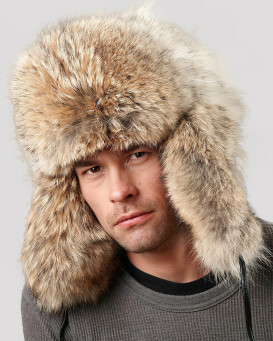 I would recommend this hat and Fur Hat World to my friends and family. I love this hat it fits great and boy is it warm it keeps my bald head nice and toasty.This is a well made product and looks good as well.This my third hat for fur hat world I will buy more for sure. Luv the look, quality in both workmanship and fur, the fit and warmth of my hat. Extremely satisfied with the company and its services/products. Thank you for my hat fur hat world! !